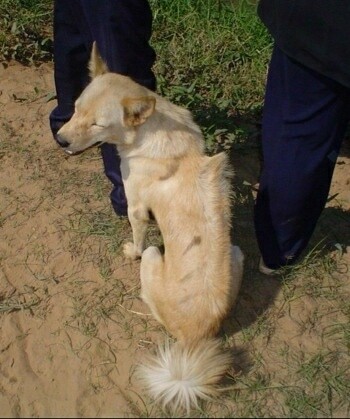 An adult Cambodian Razorback Dog, very rare and quite different than the Thai Ridge back or Phu Quoc Dog. The Cambodian Razorback is a longhaired dog. It is powerful for its size and, although muscular, it is active and agile. Head: Short, deep thorough, broad skull, very pronounced cheek muscles, distinct stop, short foreface, black nose. Eyes: Dark, round, of medium size, and set to look straight ahead. Some may have blue eyes. Ears: Pricked and alert at all times. Mouth: A bite in which the outer side of the lower incisors touches the inner side of the upper incisors. Coat: They have a long coat which would seem uncharacteristic of a “Tropical Dog,” however, it does not seem to bother them as they do not overheat. The tail should be “bushy” and the ridge on the back pronounced. Color: Combination colors with white and black, blue, brown and fawn are common. They also come in solid colors without white. Gait: Free, powerful and agile with economy of effort. Legs moving parallel when viewed from front or rear. Discernible drive from hind legs. Cambodian Razorbacks are a primitive breed but not with the characteristics one would associate with other primitive breeds. Primitive or Pariah Dogs are found everywhere in Cambodia but this particular dog exhibits different characteristics. They are friendly and good natured with their family. However, this dog is protective and territorial when it comes to strangers. They are natural guard dogs and can be used for hunting as well. They are larger than a “Phu Quoc” Dog (Ridgeback found on the coast) and do not bark as often. They only bark if there is a need for it. They exhibit the power and confidence of the Thai Ridgeback Dog and are of similar size. Compared to the other two known ridge-backed dogs in the region they are physically very different. These dogs are not for the novice buyer and need to be socialized at an early age. Height at shoulder: Males up to 20 inches (50.8 cm) or more. Females are smaller. In proportion, the length of back from withers to tail set is equal to the distance from withers to ground. Cambodian Razorbacks will do okay in an apartment if they are sufficiently exercised. The Cambodian Razorback does not need a lot of grooming. An occasional combing and brushing to remove the dead hair will do. "This is Lilly. She is a 9-month-old Razorback who is a bit on the small size. She is unusual in that she has a black stripe going down her back with the ridge/razor. She also "yelps, yodels and howls," typical of Razorbacks. They make strange noises."